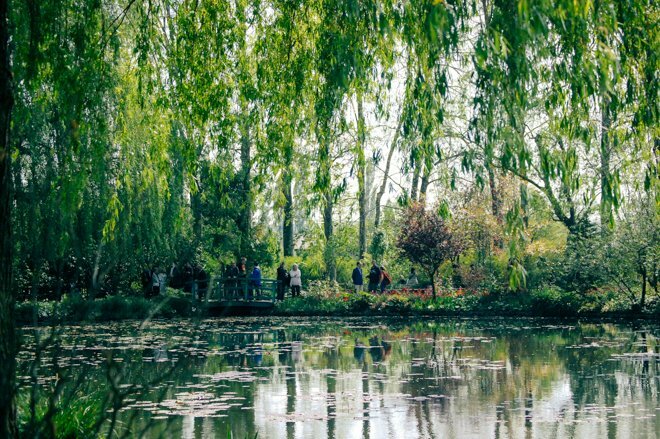 If visiting the Impressionism wing of the Musée D’Orsay is on the top of your Paris to-do list, then visiting Claude Monet’s gardens at Giverny will be a dream come true. Just 45 minutes by train outside of Paris lies a floral wonderland, boasting the brightest, most abundant blooms from April to October. 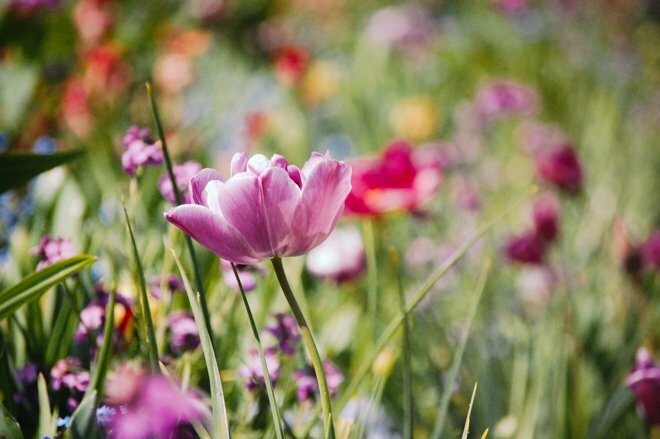 You can find a very convenient blooming calendar here, but the floral season really starts off with a bang in April with the arrival of tulips. 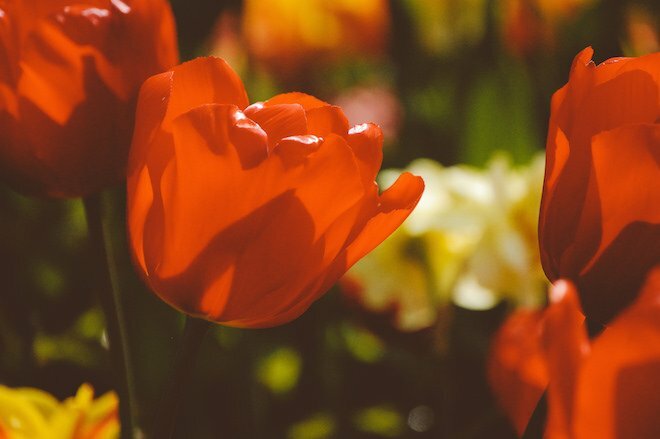 The tulips burst into blooms in every color imaginable; some of them are so bright under the sunshine that they’re a little difficult to look at directly! 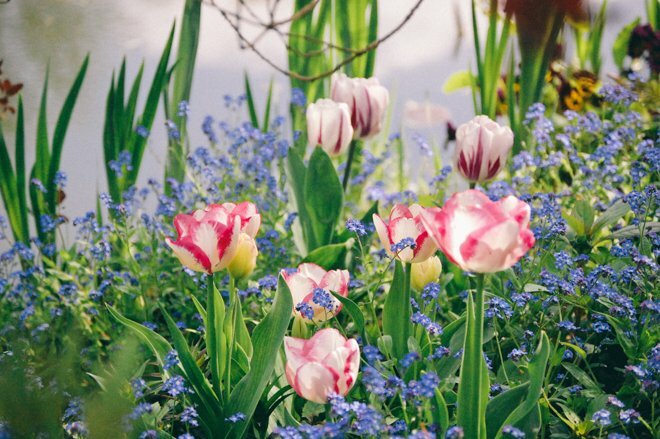 Come take a walk with us through these magnificent April gardens. 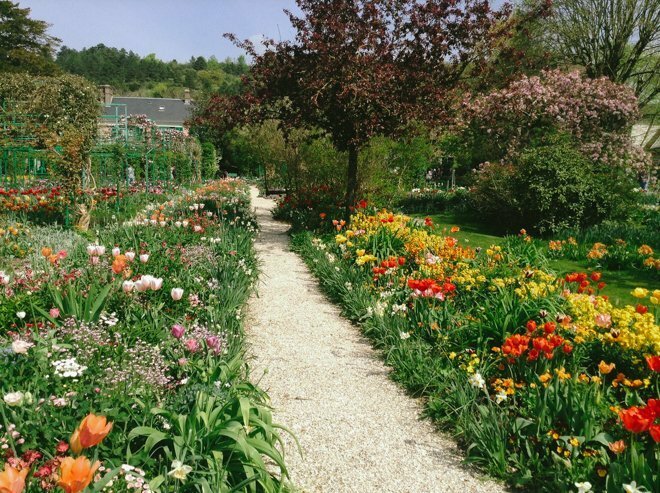 Getting to Giverny may seem daunting, but it’s really quite simple. Just take a train from Gare Saint Lazare, alight at Vernon and ride the shuttle bus to the gardens. Alternatively, you can schedule a bicycle and tour guide with Fat Tire Bike Tours and take a lovely ride to Giverny via the town of Vernon and through the grassy French countryside. 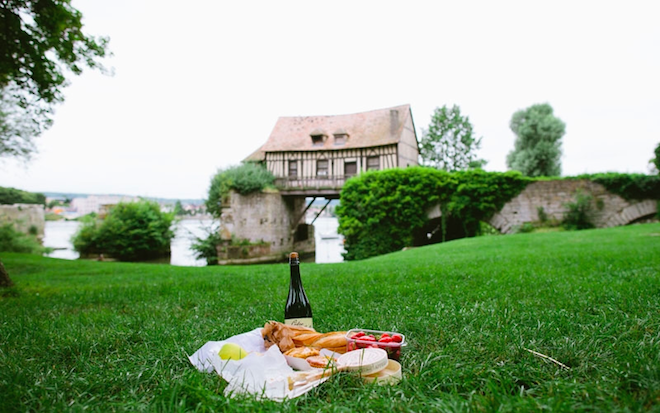 Vernon is a charming city with many medieval elements, and the grassy hills around Giverny are interspersed with old buildings and amazing picnic spots. 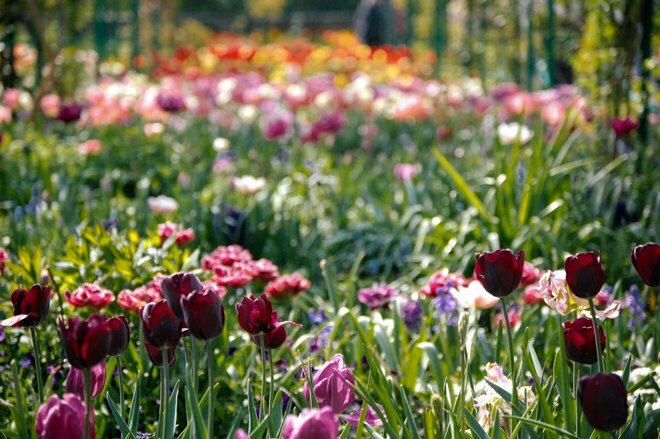 Once you arrive in the charming village of Giverny and finally enter the gardens, you’ll be greeted with a sea of tulips, bobbing their little heads in the breeze. Pink, magenta, violet, burgundy, yellow, golden, orange and red – so many colors you could spend a lifetime studying them. 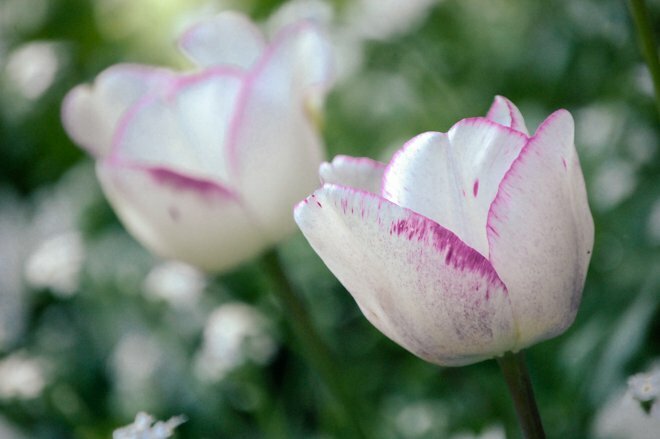 There’s also striped, spotted and textured tulips, some pointed, round, open or closed. It’s astounding how much variation there can be in a flower. Row upon row of tulips surround you, and if you need some more time to soak it all in, there’s plenty of benches around the perimeter. Next, let’s make our way over to the lily pond. 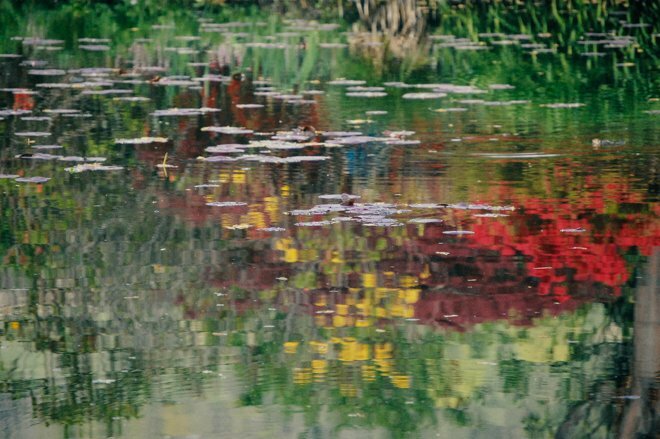 During April, the waterlilies aren’t quite blooming yet – that happens in July and August – but the willow trees are leafy green, reaching their arms towards the glass-like surface of the pond, which reflects the world above it like an Impressionistic painting. The effect is utterly dreamlike and peaceful. This is the exact pond from which Monet painted his waterlily series. Just being here helps you understand the artist, his aesthetic and the impressionist movement as a whole. We highly recommend visiting the Musée de l’Orangerie in Paris after your visit to Giverny. You’ll understand the massive waterlily canvases on a whole new level! The only two things left to discover in the gardens are Monet’s country house and the gift shop. The rooms of the house are painted in bright colors and the walls are covered in paintings by Monet himself as well as his artist friends, but photos inside are strictly forbidden. The gift shop is one of the better museum gift shops, offering a wide selection of post cards, prints, garments, books, magnets and more, all adorned with Monet’s garden paintings. If you’re craving even more floral-impressionistic goodies, head over to the Museum of Impressionism nearby. 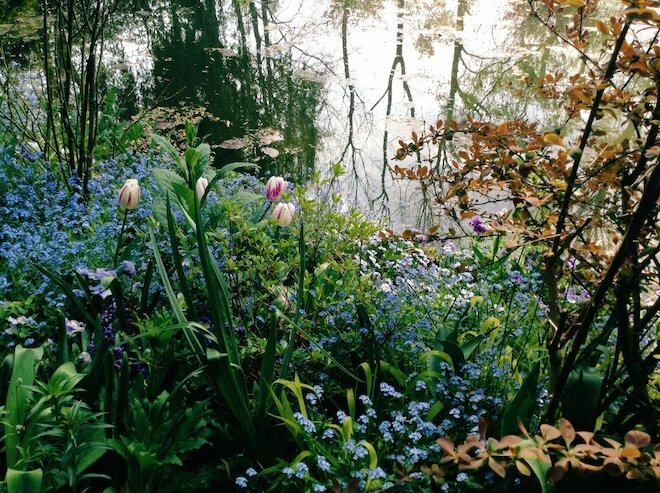 Thinking of visiting Giverny on your next trip to Paris? Fat Tire Bike Tours offers the most enjoyable, informative and stress-free way to experience all that Giverny and the surrounding area has to offer. They meet you at the train station in Paris and organize everything for you! Here’s a great video that shows you what the experience is like. To book a Giverny tour, click here! If you’re more of a lone wolf, you can pre-purchase train tickets to Vernon here. A round-trip train ticket to Vernon will set you back about 30€, and the trains from Saint-Lazare to Vernon run every 1-2 hours in both directions. The shuttle bus from Vernon to Giverny is 8€. The Gardens are open everyday from March 28th to November 1st, 2015, from 9:30 am – 6:00 pm. For more practical information like ticket prices and a shuttle bus schedule, visit the official Fondation Claude Monet website. PREVIOUS: The Salon du Livre – Perfect for Book Lovers! NEXT: The Paris Lifestyle Event You Won’t Want to Miss this Spring! Posted on Tuesday, March 24th, 2015 at 7:31 pm in See & Do. You can follow any responses to this entry through the RSS 2.0 feed. You can leave a response, or trackback from your own site.